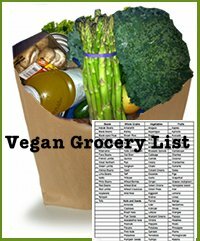 I created this vegan grocery list is meant as a time-saver for you, and a way to cut through the confusion at the grocery store. The fact is, as a new vegan, it can be difficult to sort through what things work for vegans and what things don't work. And, as a veteran vegan, it can be frustrating to constantly write the same foods down every week. The master list has everything you'll ever need to buy, all in one place. Instead of writing out everything you need to pick up at the store, you can just mark it off or highlight it on this list. Then mark it once you've found the item at the store. My recommendation is to print out the vegan grocery list on double sided paper to save paper. You can print several copies and just use a highlighter or colored pen to mark those items you need to pick up on a weekly basis. You can collect the best vegan recipes and mark off what you will need to make them, creating your own vegan menu plans. A lot of people assume that a vegan diet is super expensive, but it really isn't. Fruits and vegetables are just as cheap as hamburgers and burritos. Beans and whole grains are the cheapest part of the store. You can economize even more by buying them dried and soaking and cooking yourself, rather than just buying canned beans. You actually can get away with spending way less money on a vegan diet than on a standard diet, if you are willing to cook more often. When transitioning to a vegan diet, in the short-run you might have a few more ingredients to pick up at the store, but they won't be things you buy every single week. The more expensive vegan items are the fake meats, cheeses, ice creams, and other foods like that. When putting together a vegan pantry with this grocery list, don't feel overwhelmed or tempted to buy everything at once. Start with a few easy recipes and mark off the ingredients you will need to create those recipes. As the weeks pass, you can keep picking up a few new items at the grocery store. If you are making a big change in your diet, this process can be expensive, so take as much time as you need with the switch over in your pantry. Eventually you will be picking up less and less of the basic ingredients at the grocery store and will just be getting your weekly or daily necessities. Most of these items aren't going to be frequent buys, but with this list, you won't forget anything. Immediately after your purchase, you can download your vegan grocery list. Your grocery list is in the Adobe PDF file format, which you can download for free. After purchase, you will receive instructions on how to download Adobe and your grocery list. The eBook comes with a 100% Money-Back Guarantee: If for any reason you're not 100% satisfied with your vegan grocery list, just email me within 8 weeks of your date of purchase - and I'll issue your 100% refund immediately, no questions asked. What have you got to lose? Free Email Support: With your purchase of the grocery list, you'll receive personal email support. You are welcome to ask a question at any time. If you're looking for a more comprehensive menu plan with specific weekly grocery lists, including recipes, pictures, nutritional data, check out our brand new vegan meal plans.